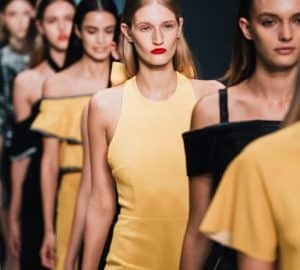 Throughout his Spring/Summer 2019 collection presented at NYFW, Zang Toi lauded the work of Yves Saint Laurent (YSL). Inspired by a purposeful visit to the YSL museum in Marrakech, Toi’s designs, in several ways, paid tribute to the career of the genius that was YSL. Many of Toi’s designs incorporated the Mondrian style which inspired one of YSL’s collections. The Mondrian style, also known as color blocking, includes graphite black lines and blocks of white or primary colors. In the instance of Toi’s collection, the predominant colors were black, white, blue, green, and purple, as well as zebra print. Black floor length gowns with front slits graced the runway, each with a beautiful pure silk lining in rich green, blue, or purple. Long coats that skimmed the floor were presented lined and imbued with rich silk colors. The long coats also contained the Zang Toi logo on the very bottom of the inside of the coat which was most visible in motion. Zebra prints made an exotic statement striking a stark contrast to the primary colors of its companions. Several of the black dresses contained dramatic statement jewelry and belts. These accessories added a beautiful pop of color to the designs, and once again, the colors ranged from blue to green to purple. The eye was immediately drawn to the beauty and emotion that embodied the color of each choker necklace and belt. Finally, there was a parade of gowns with colors in derivatives of pink. Most were primarily in the color rose just like the butterflies that were affixed to the model’s hair and dresses. One rose-colored dress contained a one shoulder strap that had pink and black butterflies appended to it. The show ended on a brilliant high note as a butterfly-covered strapless short hemmed dress paraded down the runway alone and then with Zang Toi.